This month, I was able to showcase my brand of classy and innovative digital iPad magic to the management and employees and NTT Communications’ corporate lunch event! This event was focussed upon embracing disruptive technologies (especially in the security aspect). The company adamantly believed that their image and perception of technology is best represented by my brand of iPad magic! What a great honour it is for me to be regarded by them as one of the best digital magicians both within Asia and around the world. In fact, the client wanted to book me on the month of December back in 2016, however, I was unfortunately unavailable. Yet despite the odds, they still insisted on acquiring my service as an iPad magician because they said that they only want to hire the best. I was extremely touched by their gesture. So I packed my bags and booked a flight together with my crew Elijah, as well as our newest member on our team, Anderson. It is truly a privilege to be able to fly abroad with them! The crowd during the event was highly pleasant and enthusiastic. Their reactions during the performance were good and they definitely enjoyed the moment when I produced an actual sized bowling ball from a large sketch pad. Moreover, the service and hospitality provided by our clients were first-class. We treated each other with great respect and at that moment during the event, we were not bonded simply by a business transaction, but rather, by something more. They even had a green room prepared for us before the show. It was a great pleasure performing for NTT Communications and I hope that they enjoyed by performance. In fact, the clients, of whom hired my services for this event told me that the show was worth the wait! 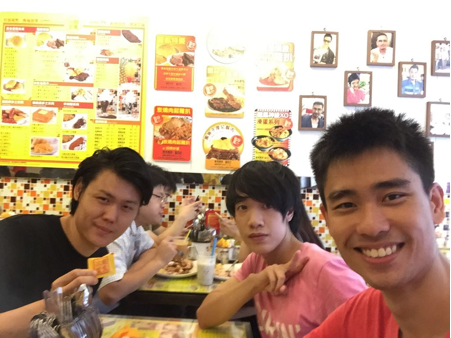 Apart from the show, I had a great time exploring the streets of Hong Kong with my team! We visited quite a number of cool and quirky cafes that sold some pretty delicious local food. My team and I also scaled Hong Kong’s very own Victoria Peak! The scene was breath-taking and the trip was definitely a memorable one! I would love to go back to Hong Kong once more and maybe spread my love for magic abroad other international boundaries as well! Alexander signing off!!! Alexander Y. is Asia’s Top iPad Magician, who has experience performing in several countries such as Hong Kong, Saudi Arabia, India! He is often sought after by technological companies to do their launches due to his skill in combining technology with magic. Newer PostA magical afternoon @ Xinmin Secondary School’s homecoming day.